October (and September) baseball is finally here. It's finally time for 10 teams, each with their own story, to have their chance at the World Series crown, and immortality. First, we must decide what teams are going to be our Wild Cards in the NLDS. So, over these next two days, four teams will be playing one-game playoffs, one for each the NL and AL, with a chance to punch their ticket to the Division Series. And after that, anything can happen. Here is my Wild Card preview. The Oakland Athletics were just one loss (and a Mariners victory) from missing the postseason altogether, but a 4-0 win over the Rangers sealed the deal. On July 31, they had the best record in baseball, but a questionable trade of Yoenis Cespedes to Boston has caused them to have the fourth-worst record (tied with Twins) since. Tonight, Jon Lester (the return in the Cespedes trade) goes for Oakland, who's roster is too talented to lose this game. As for the Royals, they have an ace in James Shields going too, and this is their first postseason appearance since 1985, so the crowd in Kansas City will definitely be on their side and try to help them in any way possible. The reason I can't pick them in this game is due to the lack of postseason experience in their lineup. Shields has some, but other than that, almost all of their homegrown players (which is most of their lineup) weren't even born the last time the Royals made the playoffs. The San Francisco Giants have had to overcome a lot this season to even get to where they stand today. They battled injuries; poor play from the second base position, a spot they even used Dan Uggla (!!!) in; and tough competition this season. Tomorrow, they have Madison Bumgarner on the hill, perhaps the most underrated ace in the game. Bumgarner has postseason -- and World Series -- experience and there is nobody in the Giants' staff that I'd rather have be pitching in this game. As for the Pirates, almost their entire roster has postseason experience. Even the guy on the hill, Edinson Volquez. Volquez was signed to a one-year, $5 million "prove it" deal this offseason and he has done exactly that. He won 17 games back in 2008, but still hasn't been able to live up to his potential. This year, he's pitched pretty well, posting a 3.04 ERA in 32 games (31 starts). The fact that scares me is that he has a 5.09 ERA in 85 games (84 starts) from 2011 to 2013. We'll see how he does, but I'm skeptical if he can repeat his performance in one game tonight. The Houston Astros have announced that they have hired A.J. Hinch to become their next manager. Hinch, 40, was the Diamondbacks manager from 2009 to 2010. At the time of his naming, the 34-year-old (357 days) Hinch was the youngest manager to accept a managing position since Eric Wedge (34 years, 275 days). He was fired the next season, in 2010, after starting the season 31-48. His overall 89-123 record in 212 games. His .420 winning percentage ranks second lowest in Diamondbacks history. He has a lot of experience within the managerial side of baseball. 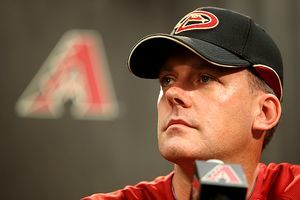 Prior to the 2005 season, he was hired as the Diamondbacks manager of minor league operations. In July 2006, Baseball America named him as one of the "10 to watch" in the next 10 years to become a farm director or general manager. In August 2006, the Diamondbacks named him their director of player development. On September 21, 2010, he was hired by the San Diego Padres to become their vice president of professional scouting. He resigned from his position on August 5, 2014. His experience within the front office makes him a great choice to become the Astros' next manager. He'll fit in well with Jeff Luhnow and the rest of the Sabermetric oriented front office. "I am extremely excited to bring in A.J. as our new manager. Throughout our process, we searched for a person with previous Major League experience, who could effectively lead our young, growing nucleus of talented players. I have no doubt that A.J. is the right person to do that. He brings experience as a Major League player, Major League manager and player development executive. His skillsets and leadership abilities will be enormous assets in our clubhouse and to our entire organization." The Astros made changes to their coaching staff earlier this month, firing ex-manager Bo Porter, while naming Tom Lawless interim manager. Hinch will now be handed the task of trying to bring the Astros back to contention into the future. The Minnesota Twins announced today that they have fired long time manager Ron Gardenhire. He has been offered another position within the Twins organization, GM Terry Ryan said at a press conference. The Twins new coaching staff will be decided by the team's new manager and Ryan. Gardenhire has managed the Twins for 13 seasons, winning the 2010 American League Manager of the Year award. The Twins finished their fourth straight season with 90+ losses and not much improvement has shown, even with the farm system that is fairly deep. Over his career as manager, the Twins have gone 1068-1039, finishing in an average 2.5 place in the AL Central. He was named manager of the team in 2002, replacing Tom Kelly, who had won two World Series with the club. He was initially hired by the Twins in 1988 as a manager in Minnesota's farm system. Then, in 1991, he became the Twins first base coach, a position he held for 11 seasons. This is the Twins first managerial search since 1986, when they hired Kelly. USA Today's Bob Nightengale predicts that either Terry Steinbach or Paul Molitor (both members of the Twins coaching staff) will be the team's next skipper. Red Sox bench coach Torey Lovullo could also be a name for the Twins position, according to Jon Morosi of FOX Sports. Gardenhire would be a prime candidate to become a manager immediately for another team, as his major league longevity and success are two factors that many teams are looking for. The Miami Marlins announced yesterday that they have agreed upon a two-year contract extension with manager Mike Redmond to keep him in the organization through 2017. Redmond, 43, was hired to become the Marlins manager prior to the 2013 season on a three-year contract, which runs through next season. He has led the team to a 15-win improvement from '13 to '14, even with the injuries to Jose Fernandez and Giancarlo Stanton, and his style of managing is liked highly among many within the game. Overall, the Marlins have gone 139-185 over his tenure. "On this last day of the season, it’s the perfect way to start this offseason, making sure everyone realizes…our commitment to Red...We knew we were bringing him into a situation where he was going to grow with the team and we’ve watched that happen. The team and Mike have grown in lockstep." The Marlins may become closer to contention next season, as their young team is improving and the leadership of Redmond is fantastic. By keeping him under control through 2017, the Marlins are doing a great job of keeping the same voice in the clubhouse and it seems that the team could really go far under his discretion. Redmond has done a fantastic job in his position. Jordan Zimmermann put on a show today, tossing a no-hitter, the first in Nationals history since moving to Washington in 2005. His nine brilliant innings came in Washington's 1-0 win over the Miami Marlins. He will forever reside in the record books. Zimmermann's no-hitter is the second consecutive no-hitter on the final day of the season. Last year, Marlins pitcher Henderson Alvarez tossed a no-no in Game 162 against the Detroit Tigers. He was starting against Zimmermann today, so he gets to be a part of history for the second straight season. My brother Gavan was at the game today. He witnessed Nationals history. "What a game," he said. "I can't believe that Jordan Zimmermann, on the last day of the year, got the first no-hitter in Washington Nationals history." "The fans were so loud I thought that the stadium was going to explode. The Nats sure have some good fans...It was awesome being there and I am so glad that he was able to do it." On the offensive side, it was a Ian Desmond home run in the second inning that led to the Nationals lone run today. They did get 11 hits overall, but were not able to string any of them together to put a real dent in the scoreboard. Jordan Zimmermann retired the first 14 Marlins batters before walking Justin Bour in the top of the fifth. He and Garrett Jones -- who reached on a strikeout wild pitch -- were the only base runners the Marlins got all day. Zimmermann struck out 10, lowering his season ERA to a career-best 2.66. He finishes with a 14-5 record in 32 starts on the season. Zimmermann was through 8 2/3 innings and only Christian Yelich stood in his way between him and history. Then, Yelich hit a hard line drive to left center field, and Steven Souza Jr. made an unbelievable jumping catch, crashing to the ground to wrap up history. You can view the video of Souza's catch here. "A magnificent catch," Gavan said. "Seeing it in person was just amazing." 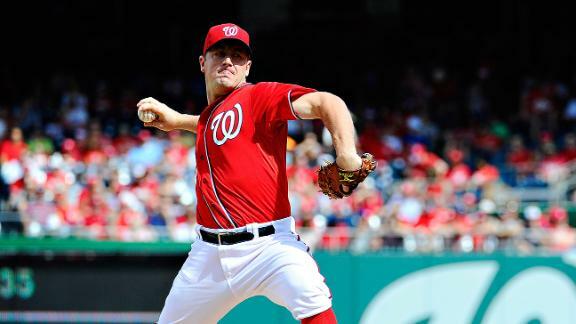 Congratulations to Jordan Zimmermann on throwing the first no-hitter in Nationals history.